I hope everyone had a great weekend. It was quiet here, just the way I like it! 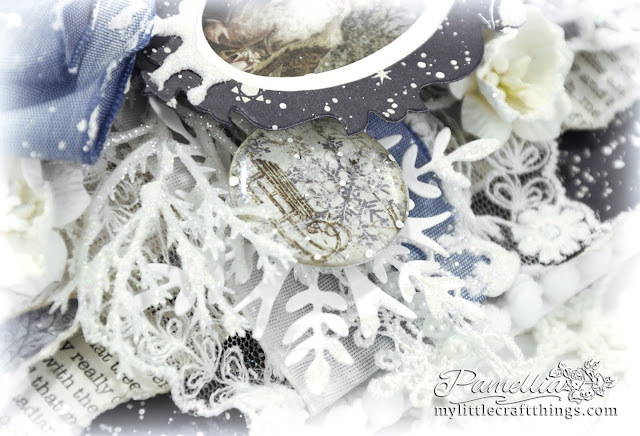 It's time for another Christmas card video, this time using some products from Michael's Craft Store and Recollections. Hope you enjoy. So I finally get to show you a few shots from my couple of hours out in the snow. 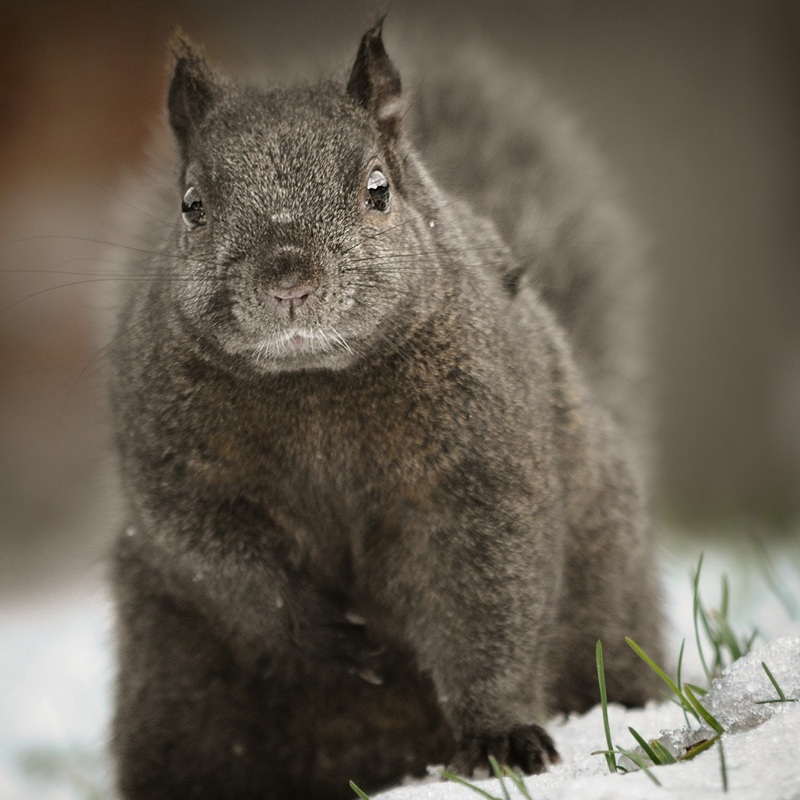 We are due for a big dumping of snow Sunday night, so I hope that, as you are reading this post, I am outside with the squirrels, frolicking in a full size snow bank! I am loving my new bird feeding spot. I really need to video it some day because sometimes I have two or three birds fluttering around waiting to land on my hand and grab a treat, they are even landing on my shoulders and arms waiting for their turn at the buffet!! It's incredible! This is a sweet Red Breasted Nuthatch. 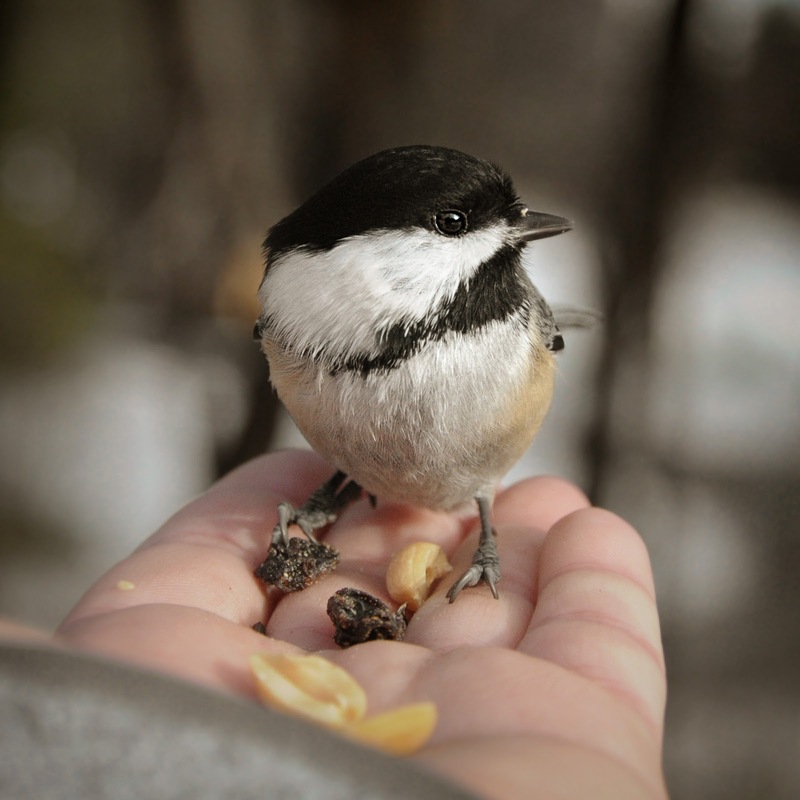 and a Black Capped Chickadee. With all of the construction building the Community Centre this summer, I avoided the lake because of the noise, but they are all done now. I will be going back more often, I really missed the ducks, geese and seagulls. 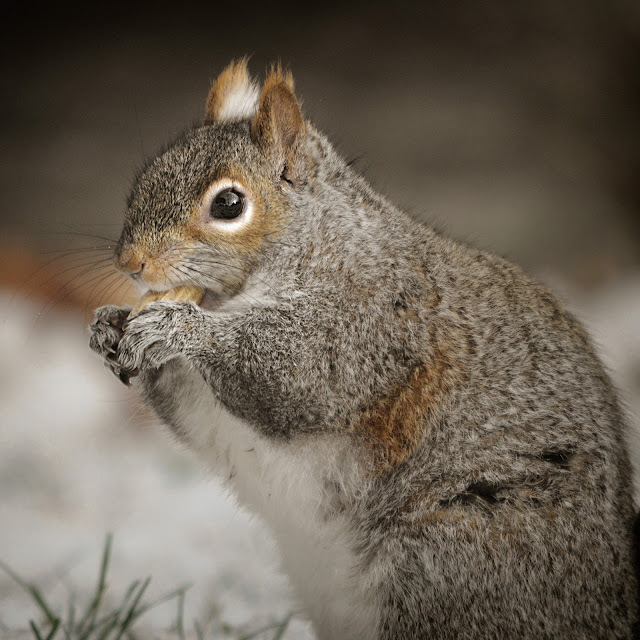 Some of my wintery squirrel friends were very hungry! Don't you just love their wintery coats? So fluffy and colourful, and those chubby butts really make me giggle! I love the way the snowy world reflects in their eyes, making them look even more beautiful!! 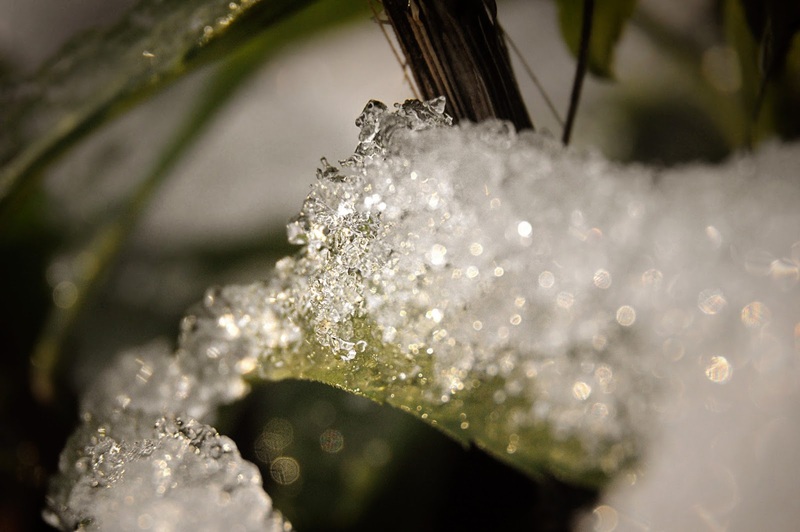 Last but not least, my macro shot is some snow crystals on a, still very green, piece of foliage. A couple of years ago when I started making fancy cards, I scoured the internet for some cute poems that were related to giving a handmade card and not a store bought one. I really didn't have any luck so I decided to start writing my own. and send it off to you. for a Happy New Year too! Stunning card. I always love your videos and this is the best one yet for me as it showed me how to lots of things I do in the wrong way and they look a mess when I do them. Thanmk you for taking time to make your videos. Beautiful card as always Pamellia. You are amazing with these. I love this different shade of blue and glad to see the bonus of out door snaps and the snow, which unfortunately we dont experience in this part of India. Hugs my friend. 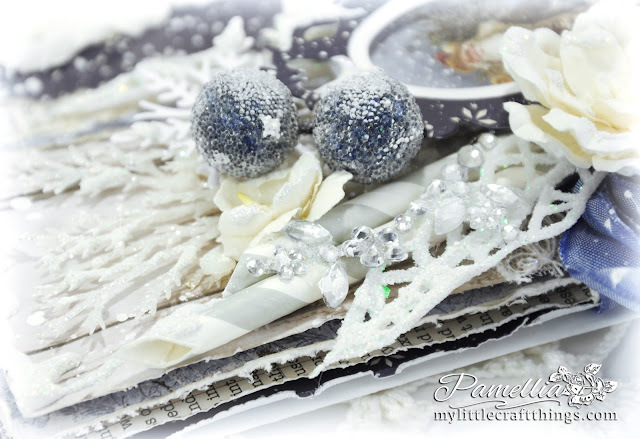 Oh my goodness, Pamellia, I so enjoyed reading your amazing post, with a fantastic card, awesome video, phenomenal photos and even a fabulous poem! You are so generous, my sweet friend! What a super multi talented lady you are! Thank you so much for this huge portion of beauty! The card is spectacular with such a perfect layering, as always! Only your super creative mind can create such a stunning composition of so many fantastic details! I am so glad you filmed the process! It's brilliant! Thank you so much for the poem! Everything you do, you do with so much love and creativity and passion, my friend! A delightfully decadent card with all it's layers, glitter and lacy trimmings. Blue is a colour that I very seldom use, not that I don't like blue but I find it difficult to match with other colours and I tend to lean towards warmer shades. 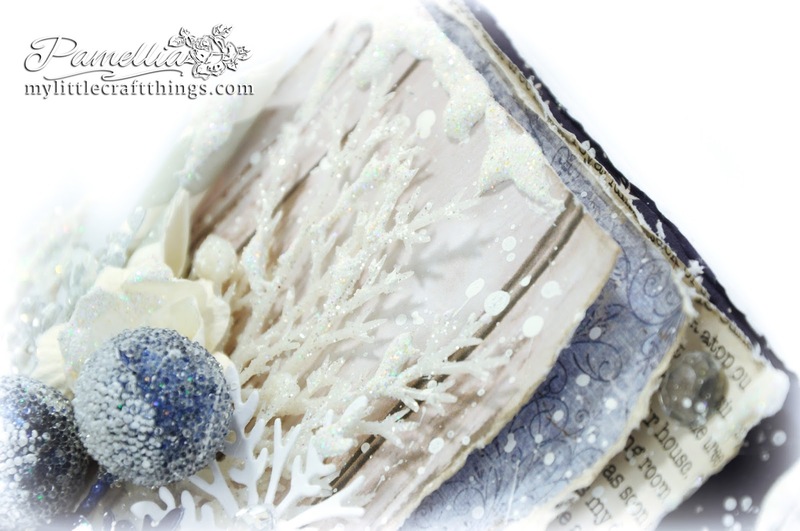 But this one is such a gorgeous, frosty creation. Your gorgeous card perfectly captures the magic of a snowy Christmas Eve. All of the lovely details and embellishments work so perfectly together. I haven't had time to check out the video yet, but rest assured I will when I have time to e njoy it properly! Hope you're out playing in the snow! Fantastic card Pamellia !! Awesome color scheme ,layering and your poem is cherry on the top !! A totally stunning card Pamellia. I so adore the many layers you manage to add to your cards without making them look overloaded .. there always seems to be just enough. The same with all the embellies you use. There is just the right amount of lace and the right amount of bling not to mention just the right amount of splatters and 'snow' .. absolutely divine!!! .. and I love seeing it all come together .. you make it look so easy!! Oh my gosh, what a totally amazing card, Pamellia!! The layers are spectacular!! 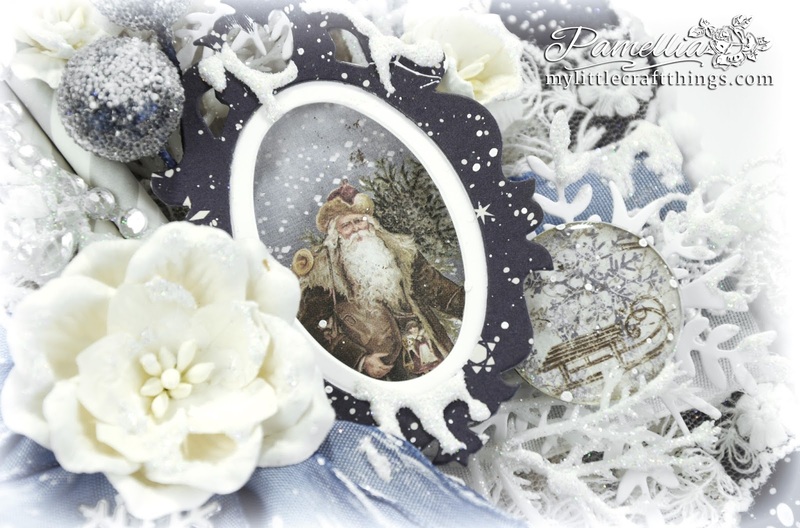 I love how you framed Santa and the perfect details you added!! I'm so excited there's a video!! Yipee!! This is truly stunning my friend!! I don't know how you do it each and every time!! I can't wait to see how you put it together!! Wow - the nature shot today is so artistic and beautiful!! And seriously, how do the animals keep getting cuter!! I love, love the shot of the bird in flight!! I'm thinking National Geographic needs to hire you!! Seriously, Pamellia, your photography is perfection!! The macro is stunning...even if it does make me shudder!! We had a small dusting of snow the other day but it quickly melted. It's been chilly, too. I'm one of those sick individuals who does not want a white Christmas!! And good grief, is there nothing you can't do?? That poem is amazing!! Perfectly constructed and it would be so wonderful in a card!! I love, love it my friend!! OMG Pamellis your card is stunning, I love the frosty look and the shades of blue are fabulous, lots of beautiful embellishments too and the Santa image is wonderful. 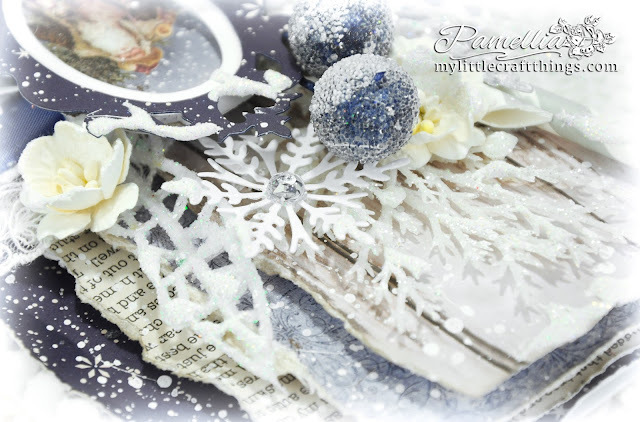 Another stunner Pamellia..beautiful colours and details..love your berries and the little frame around Santa..gorgeous..I love your Christmas poem and thank you for sharing..
Oh, your card is so elegant and gorgous in blue and white with the touches of silver!! Amazing peeking background that seems a starry night!! Love the Santaìs topper and all the wonderful details! Great distressed layers and adorable diecuts and flowers!!! So so happy that you have been in the snow and feeded your furry/feathered friends!! :D They surely blessed you!! 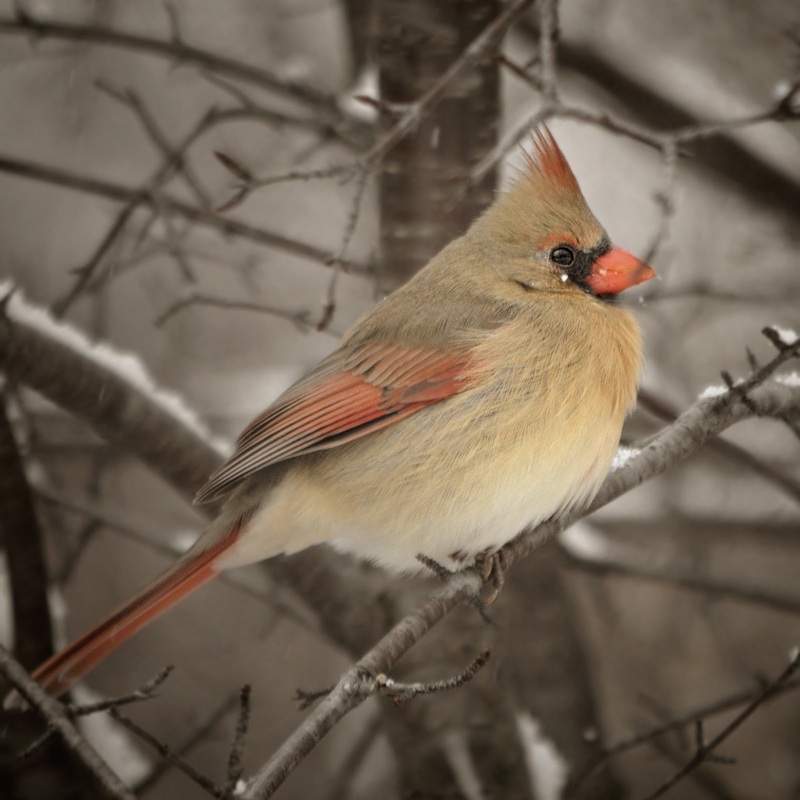 Amazing photos of the cardinals and the little blak capped chickadee is the sweety in person!!! All the birdies on your arms waiting for food... This is magical!! 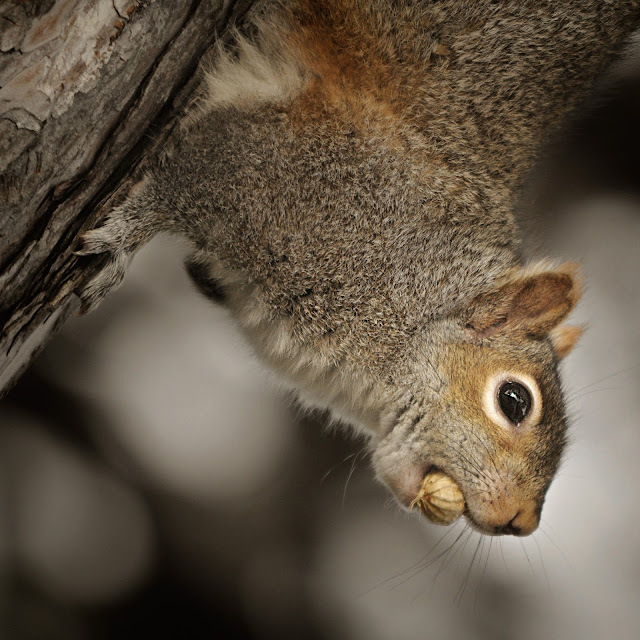 :D And I could stay here hours to look at the hungry squirrels eating their peanuts!! Hugs my friend, cross my fingers and hope that you can go in the snowy wood again and again! .... Forgot to say that you have really a lot of talents, my friend!! Such a lovely poem to write on Christmas handmade card! All the recipients will be stunned twice: one for the card and the second one for the poem!! Your card is exquisite, the video, as always is amazing! I don't know if it is just me but your photos just get better and better, the bird ones today are superb and the squirrel ones make me just want to reach out and touch them! 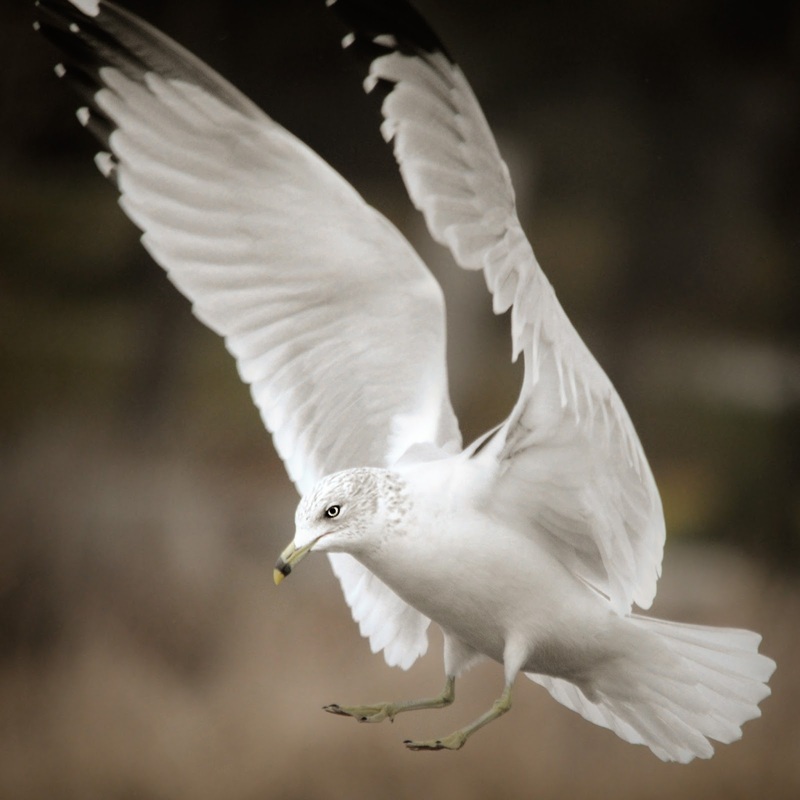 That seagull is a fabulous shot and so is your macro today! Its a wonderful post to read again today. Your card and video were awesome. 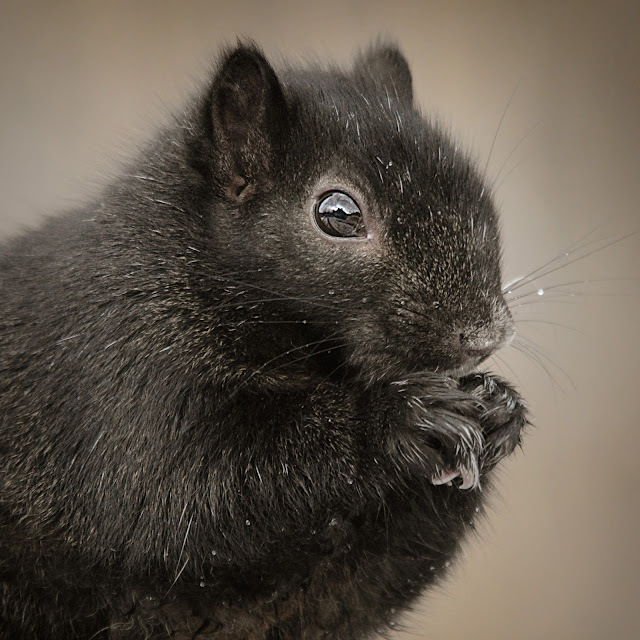 The photos are stunning, loved the squirrels and yes you can see reflections of light in their eyes. Its a lovely poem as well Pamellia. 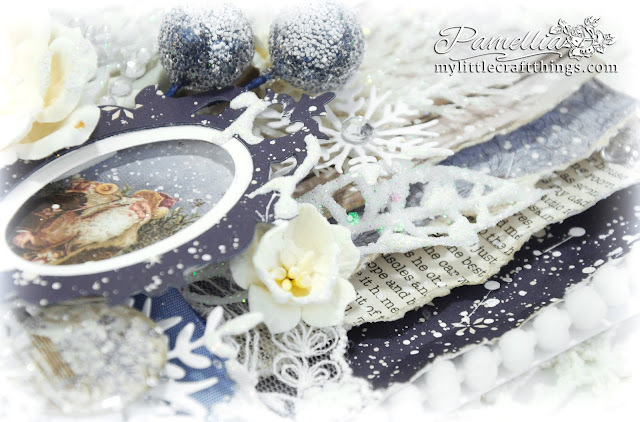 Gorgeous Christmas card Pamellia, love the textured layers of beautiful blues and gorgeous embellishments. Your photos really are amazing, you can see so much detail on these beautiful birds and squirrels. Lovely verse you talented lady! thank you for sharing. 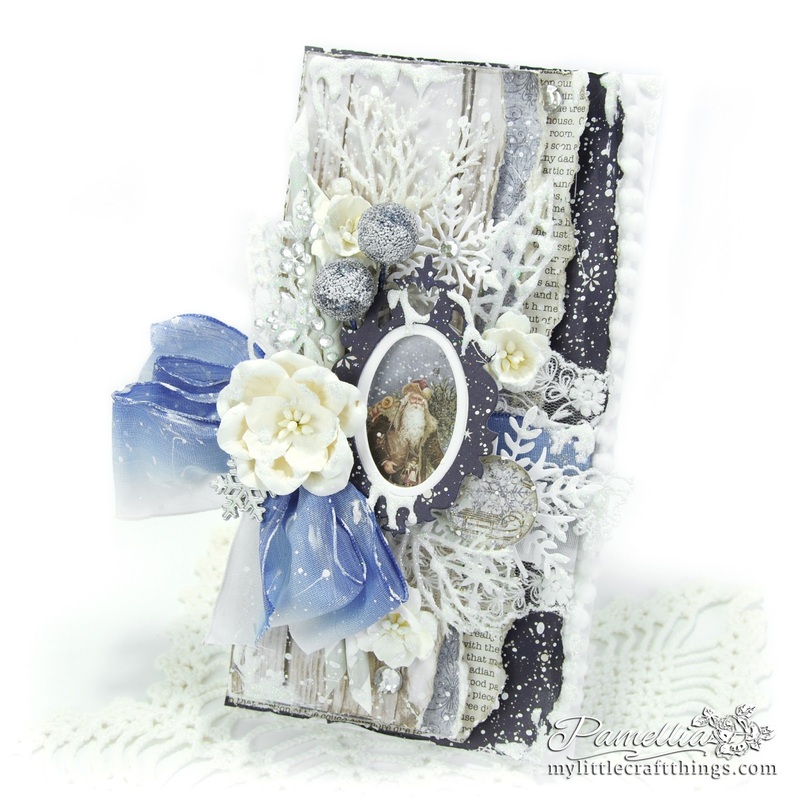 Gorgeous card, Pamellia! Love the video! Your photos are simply stunning! You really are a fabulous photographer...love all the birds. Maybe a new career? LOVE your card book make! Great pages, and love the the stars...beautiful layers. I really enjoy your videos and your card is stunning!! Like how you added the straws in there too! 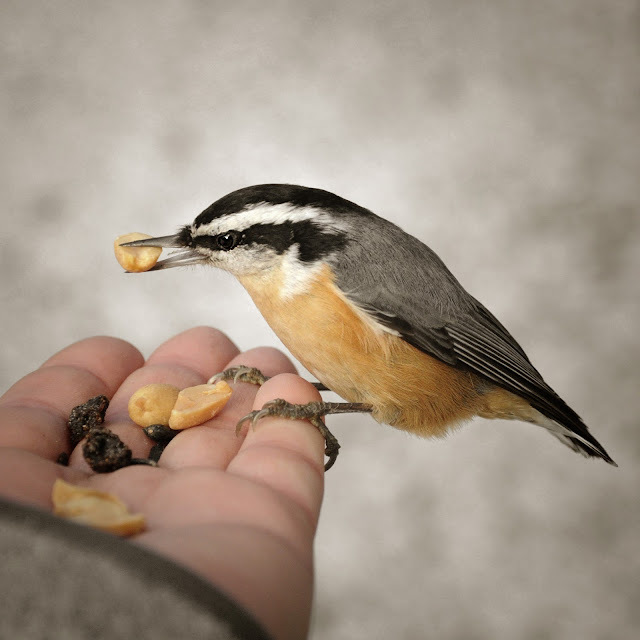 Gorgeous photos... How do you take a picture with a bird on your hand? Love your poem too ... Multi talented, sweet and kind lady! 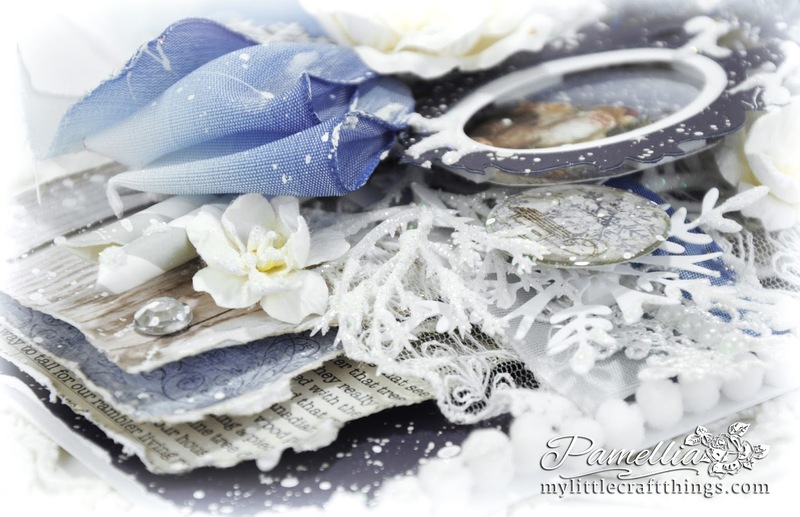 Gorgeous shabby chic card in my favorite colors! Pamellia, this post was truly a treat for me this morning! I got to see that amazing vidoe, and it really brought your lovely layers to life! I am so in awe of your vision for these products and how you execute their use! Every time I walk around Michaels' I think "How would Pamellia use this?" Just stunning, my friend! Your photos are the icing on the cake, and I'm so looking forward to seeing more snowy shots! 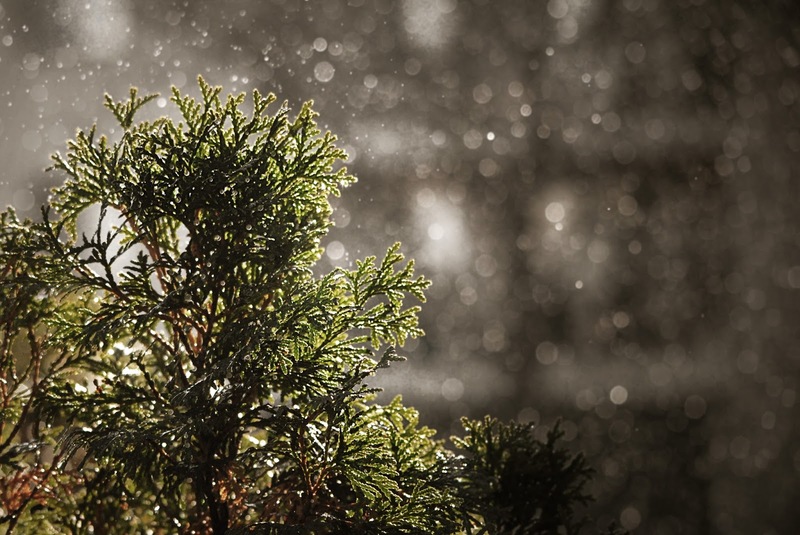 Your landscape and macro shots make me wish for snowy days! We had our "winter" days over the weekend with temps in the 20's, then back to a gorgeous spring day (dang, had to work!) yesterday and by the end of the week we will be back to winter (after the moisture moves out), and then summer on Sunday! Geez! Talk about crazy weather! Sorry if I sound like a goofball. Where my computer is might as well be Grand Central Station, and I keep getting interrupted! This is why I don't go on my computer much these days, but it is the only spot in our home my computer picks up WiFi! Sending you big hugs! Thank you for all your inspiration! PS Have you checked out the magazine "Birds and Blooms"? I think your photography would be snapped up by them! Wonderful, I really could sit and watch you create all day long, I find it so uplifting. Thank you for this fabulous video and what a stunning card, wow! I love all of the blues and what about all of the bling and glitter? All of the layers and beautiful flowers, I could go on and on. 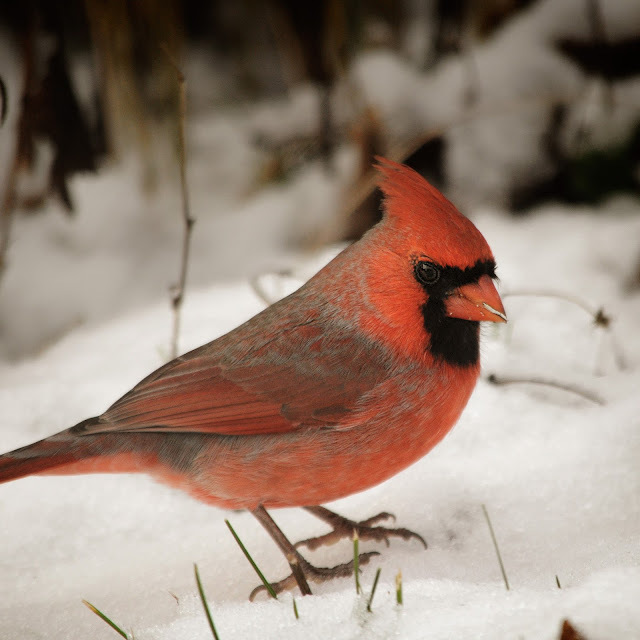 Great to see some snow at last and I cannot get over how tame all of those little birds are. It is also lovely to see you back at the lake. You make me happy again with this video card and inspire me very much! A shabby Christmas card in nice colors, snow and glitters...and the book page is cool!!! Thanks for your Christmas poem...so sweet! Another lovely video to watch and great card. Loving all your photos. 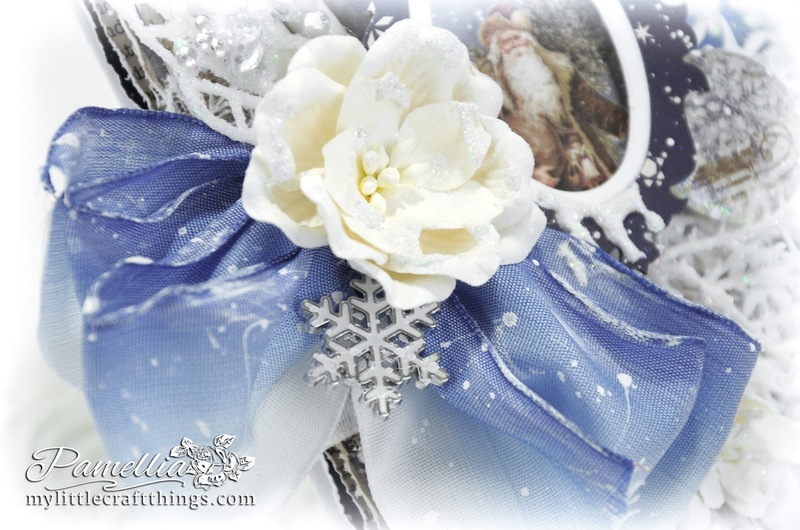 Pamellia I am awestruck at your wonderful card - love the hints of blue on it, and the gorgeous blue bow!! Your wee friends really know that you are to be trusted - what wonderful photographs you have. You may receive amazing comments, but that is because you are amazing!! So glad I took time out with my coffee for a catch up. Love this card and thanks for sharing the video which I will look forward to watching. Amazing wildlife photos today. Love the gift you make for Lisa in the previous post too. I can't wait to get home so I can watch the video! So very thankful that you do the videos, it sure helps this girl out very much. And that you got most of everything from a place AI can get it as well. That Santa is something I must get my hands on! Bwahahaha! Lovely lovely lovely design and details of course. Such a perfect Christmas card!